A motorcycle is basically a contraption with two wheels and a motor that takes you to your destination. But sometimes it can also be a work of art that turns every journey into an experience. 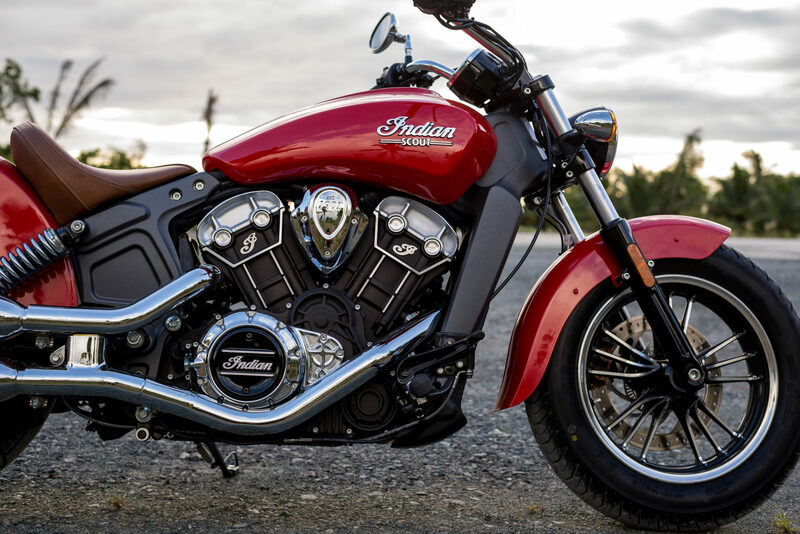 The Indian Scout is one such motorcycle. It may sound like I’m waxing poetic here, but can I help it if it made such an impression upon me? Believe me; you would feel the same way, too. 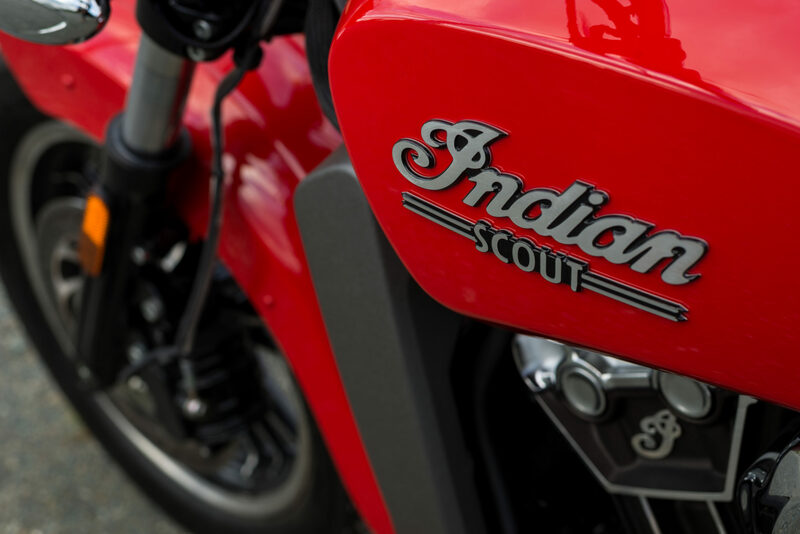 But before I delve on how wonderful it was to ride the Scout (more on that later), allow me to share a little bit of history about the famed Indian brand. Ask any old-school biker out there about the Indian marque and he would probably tell you stories about the legendary Indian motorcycles like the Chief or the Scout that his grandfather used to own. Sadly, many younger motorcyclists out there, especially here in the Philippines, know nothing about the brand. Chances are, they’ll ask, as I’ve experienced annoyingly for several days, if the Indian Scout I was riding is made in India. Don’t get me wrong. I have nothing against Indian made motorcycles. It’s just that the Indian brand refers to the Native American Indian, rather than the South Asian kind. But then again, even the Indian Motorcycle company is nowhere near the Western Frontier of the early Americas, but in Springfield, Massachusetts on the east coast where the company was founded in 1901. Initially known as the Hendee Manufacturing Co., the “American Indian” name, later on shortened to just “Indian”, was adopted by company founders George M. Hendee and Oscar Hedstrom simply because it gave better product recognition in export markets. Not long after the company was founded, the first Indian motorcycles were sold to the public in 1902. The following year, company co-founder and chief engineer Oscar Hedstrom set the world motorcycle speed record of 96 km/h. Not exactly fast by today’s moped standards but record-setting for a two-wheeler back in 1903, nonetheless. From 500 bikes annually, the company would produce as much as 32,000 units by 1913, making Indian the biggest motorcycle manufacturer in the world. Not only did competition success play a vital role in Indian’s rapid growth, it spurred technical innovations as well. One of the company’s early successes in racing was when riders Oliver Cyril Godfrey, Franklin, and Moorehouse finished first, second and third place, respectively, during the 1911 Isle of Man TT. Indian’s most popular models were the Scout, made from 1920 to 1949, and the Chief, made from 1922 until 1953 when the company, due to financial woes, finally went bankrupt. 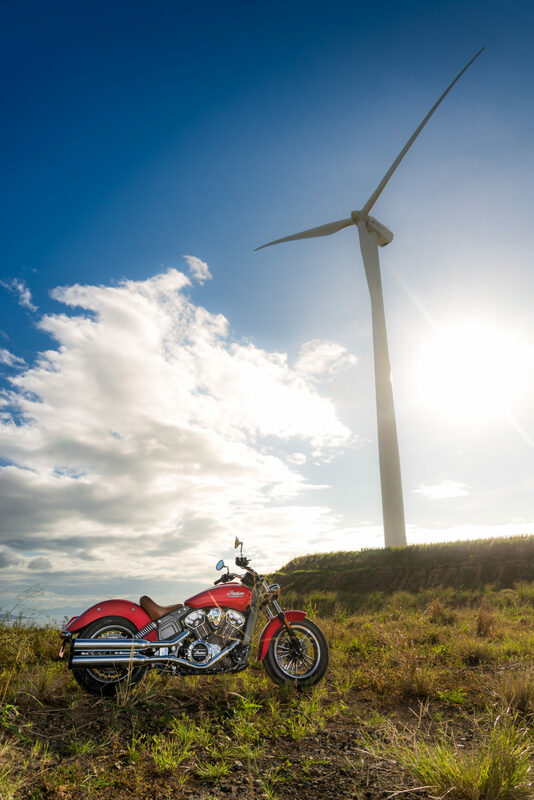 Several organizations tried to resuscitate the Indian brand in subsequent years with limited success until Polaris Industries purchased Indian Motorcycles from its previous owner, Stellican Limited, a London-based private equity firm, in 2011. 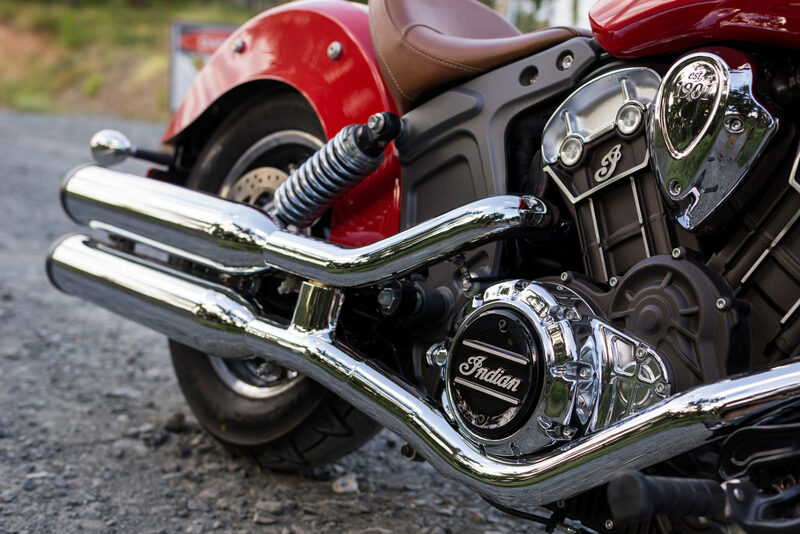 In March 2013, Indian unveiled their new 111 ci “Thunder Stroke” engine and began selling their newly designed motorcycles powered by it by August of the same year as 2014 models. Polaris announced three models that would be powered by the 111 ci “Thunder Stroke” Engine: the Chief Classic, Chief Vintage, and Chieftain. In 2014, Indian introduced the Scout during the Sturgis Motorcycle Rally as a 2015 model. 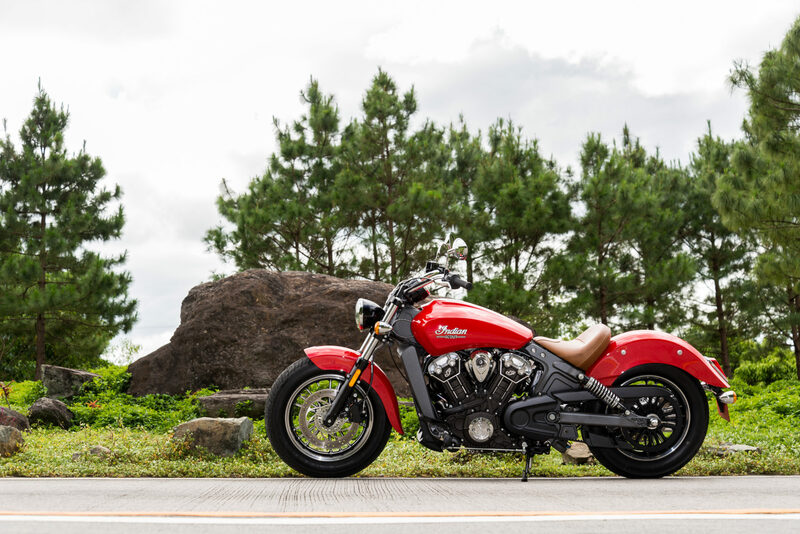 Barely two years after its debut in the United States, the Scout and its Chief stablemates finally landed on our shores via its exclusive Philippine distributor Access Plus. 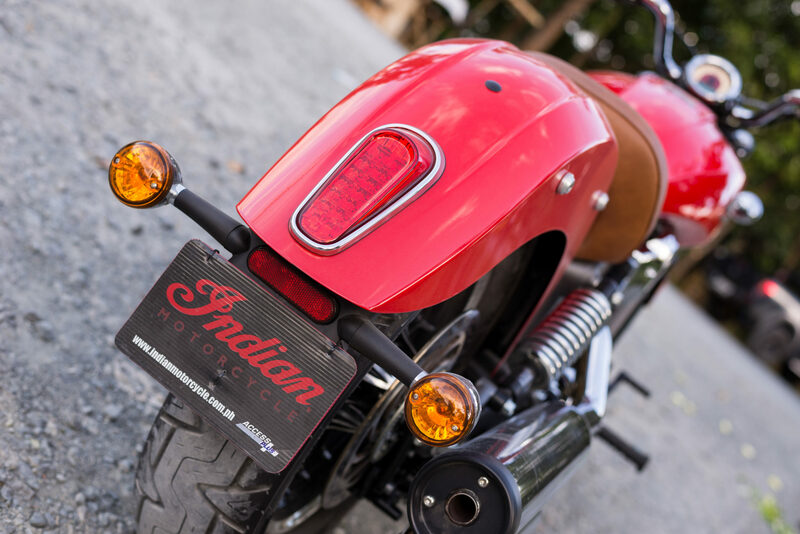 They held their showroom opening on January 13, 2015 and a few days after that we were granted first dibs on the lovely Wildfire Red Indian Scout you see here. 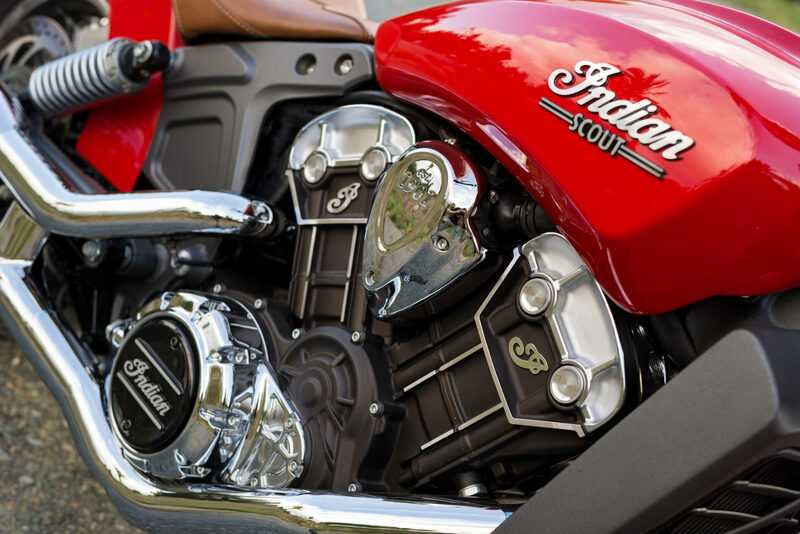 The Scout is the sportier model in the Indian lineup, thus the designers took a different approach when designing it. For starters, the Scout doesn’t use any conventional steel tubes for its chassis. Instead, engineers crafted its chassis from several pieces of aluminum bolted directly to the front and rear of the engine using it as a stressed member. 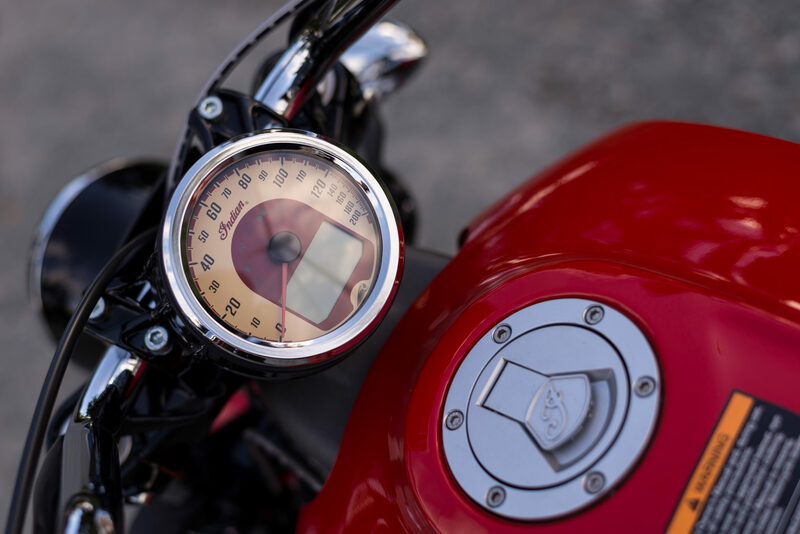 This means the engine needs to be very smooth, otherwise the vibrations on the whole bike would be horrendous with obviously undesirable results. But it doesn’t. The engine, while a 60-degree V-twin, is a modern design that uses liquid cooling, fuel injection, timing chain, DOHC and 4-valves per cylinder rated at 100 bhp at 7730 rpm. What’s remarkable, however, is its 72.2 lb ft of torque, more than 60 of which is already accessible from 2700 up to 7400 rpm. The V-twin also redlines at a very un-cruiser like 9000 rpm with an equally high-ish 10.7:1 compression ratio. Power is transmitted to the ground via a final belt-drive connected to a six-speed transmission. 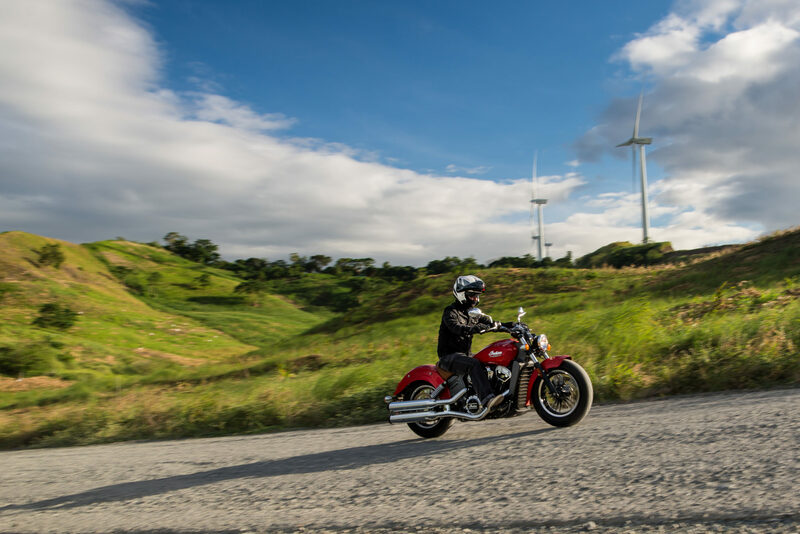 The Scout is noticeably geared to cruise comfortably at 115 km/h at 3750 rpm. But with a flat torque curve, downshifting is kept to a minimum. You can simply roll on the throttle in any gear and accelerate smoothly. 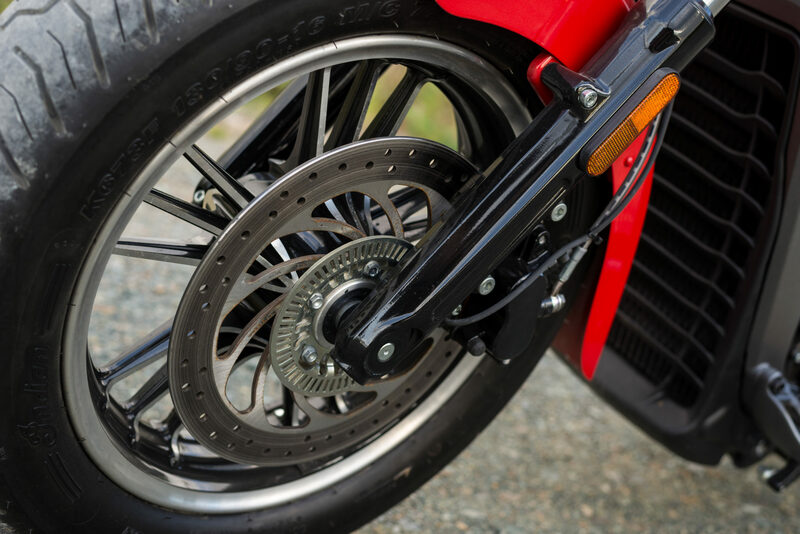 Clutch pull is light, but like the brake lever, the clutch lever is also not span adjustable. Shifting from 1st gear to 2nd is a bit notchy but this will probably smoothen out once mileage piles up. Other than that, the Scout rides like a dream. Bumps are soaked up by a pair of 41 mm diameter fork tubes up front with 4.7 inches of travel while at the back there’s a pair of spring-preload adjustable shocks that gives 3 inches of travel. Braking is handled by a pair of 298 mm rotors, one in front and one at the back. While the single pot caliper at the rear is plenty strong, the two-pot setup up front will surely benefit with another rotor to squeeze. It’s good that ABS is standard for drama-free stopping. Now, I’m not a big cruiser fan, but I find the Indian Scout to be absolutely stunning. From the headlight and forward-slanted fuel tank down to the valanced fenders, the styling is clearly a modern interpretation of the 1928 Scout. Even the leather-covered seat also echoes the 1920’s bike. The 16-inch wheels (front and back) fitted with tall Kenda tires create a visual illusion of bigness on what is essentially a fairly compact bike. The bike has a length of just 2311 mm, a width of 880 mm (handlebars) and a height of 1207 mm. It also tips the scales at just 256 kg with oil and full tank of fuel. Build quality is top notch and attention to detail is beyond reproach. If I were not a motorcyclist, I’d be perfectly happy to have one sitting in my living room. 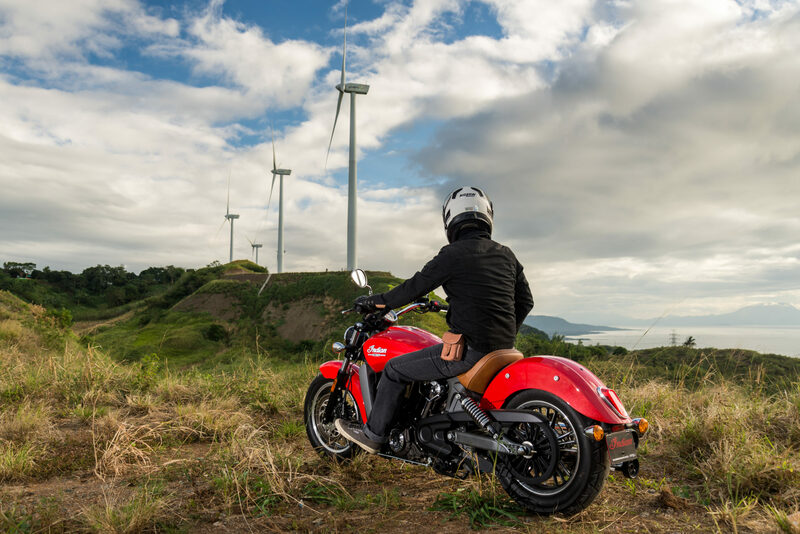 But that would be a disgrace because the Indian Scout is built to be ridden and it’s an absolute joy to ride. The low 635 mm seat height made it perfectly clear that even beginners can hop on and ride comfortably all day. The low center of gravity, on the other hand, makes for light handling while there’s plenty of ground clearance for spirited cornering before the forward mounted foot pegs scrape the road. In fact, the only time you’ll feel that you’re riding a cruiser is when you reach for the forward mounted footpegs. Otherwise, it feels like you’re riding a really low-slung performance bike. I just wish the stock exhaust sounded a bit more authoritative. Oh well, that’s nothing a set of aftermarket pipes couldn’t fix. During my short time with the Scout, I constantly found myself taking the longer, more scenic route to my destination. 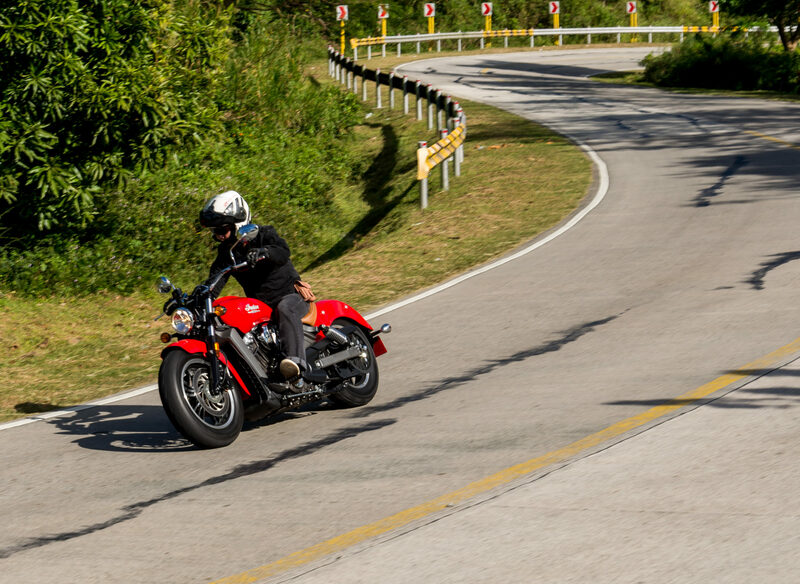 You see, few motorcycles could stir your soul into riding just for the sheer joy of it. The Scout is one such bike. It turns an ordinary commute to an event to look forward to. And for me, that’s one of the true essence of riding a motorcycle. So if you have million pesos burning a hole in your pocket, then here’s a million reason for you to buy a Scout. Even if you don’t like cruisers in general.